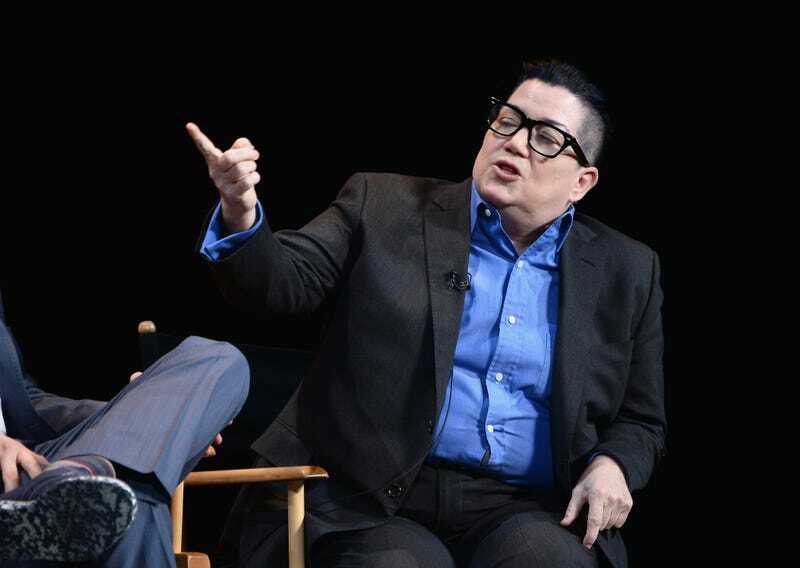 This year's lineup for Michigan Womyn's Music Festival has been announced and the inclusion of Orange is the New Black star Lea DeLaria, who has decided not to attend, had raised some eyebrows across sections of the LGBT+ community given that the festival's trans exclusionary policy is still in effect and would prohibit the attendance of co-star Laverne Cox. The list was announced by MichFest on the official festival Facebook page. To many, the inclusion of DeLaria seemed strange, given the support she has publicly given to Cox, and given the fact that a number of MichFest's most famous acts, including the Indigo Girls and Andrea Gibson, have publicly parted ways with the event. According to The Advocate, DeLaria emailed the publication with a statement expressing her decision not to attend, although it does leave something to be desired, as it sounds a bit too much like "a pox on both your houses." That said... Unpopular opinion time: while I disagree with DeLaria's original decision (and I am glad she is not participating in the event), and disagree with the exclusionary nature of Fest in general (for some very good reasons which were brought up at Japan's Dyke Weekend 2014, full coverage on that awesome, trans-inclusive event very soon), DeLaria's decision should be spoken about—but it shouldn't be unfiltered, open season on DeLaria or other MichFest acts/attendees. I believe too many transgender advocates and allies spend valuable time on MichFest they could be spending elsewhere. I understand the ire in many feminist circles, especially intersectional and third wave feminist circles, directed at Michigan Womyn's Music Festival due to its staunch and unwavering support of a trans exclusionary policy... However, and stay with me here, it's really not that big of a deal. Okay, I know what you're asking right now: how is it possible that someone such as myself would take such a cavalier attitude? I'm a trans woman. I have serious issues with trans exclusionary policies in women's spaces, and so do my cisgender women friends (and cisgender girlfriends/partners). Those women are precisely why I am not worried. The answer to the question about my attitude is actually surprisingly simple: Young cisgender women are voting with their feet, and they're voting against attending. This year there were more than 3,000 women on the land. I think the biggest year was 1985, the 10-year anniversary, when there were 10,000 women. It's been declining since then. About 98 percent of the women at festival are lesbian. There's a sense that because we're so much more visible these days that festival isn't necessary. Very few of my friends who went in the early days go anymore; they think that it's a lot of work. Some, perhaps many, both cis and trans, may be tempted to say, "good" and post an accompanying picture of GrumpyCat, but I won't go that far. About all I can really manage is a barely verbalised, "meh." I think MichFest is increasing irrelevant. It's old. It's a dinosaur. It's not that women's spaces are no longer necessary (they are! ), especially those that cater specifically (if not exclusively) to queer oriented women (again, Japan's Dyke Weekend and Women's Weekend), but rather there has been a general change in philosophy amongst those younger cisgender women MichFest would look to in order to continue on. Kirby mentions the visibility of lesbians—but it's not just that. There's more to it. In my own experiences and circles, I see young cisgender queer women increasingly reject the idea of male socialisation as so encompassing, so all-powerful that trans women are incapable of rejecting it or escaping it. My friends, my peers, and my acquaintances both Japanese and Western, who are early thirties or younger—they simply don't buy the argument MichFest is selling, and neither are the women I attended graduate school with at a woman's university. They don't want the product being sold because they find the product out of touch with their values as members of the nebulous identities of "woman" and "lesbian" and "queer" and "feminist." The thing that bothers me about the movement to boycott festival because of the policy of excluding transwomen is that anyone who goes to festival, regardless of where they are on the issue, is labeled transphobic. It really doesn't matter if you support changing the women-born-women policy. If you go, you're labeled. The biggest problem is for performers. A friend of mine was going to perform on the acoustic stage, and once the lineup was announced, she got such pressure from her fan base that she chose to pull out. They're mostly college women—and she said they were just devastated that she would consider going to festival. She wasn't responding directly to the boycott but to the devastation of her fan base. I see two big issues with her argument here. The first is that while I don't often call people (noun) transphobes, I recognise that many cisgender people are capable of transphobia. Is MichFest inherently transphobic? Yes, and in the actual original sense of the word "phobic" at that. The argument (you know, that one younger women aren't buying?) MichFest advances is that the presence of trans women is a threat to the participants or a threat to Fest itself. It is the argument that the presence of trans women, rather than adding their unique experiences as queer women to Fest, will take away from Fest. It's fear. Fear of trans people (specifically trans women, although there has always been the verbal insistence that trans men are also excluded as they do not live as women, but as who they are, men). And fear of trans people is the literal definition of transphobia. And in any case, if gender is a social construct (and it is) then how can there be women-born-women? We are all made women, and young cisgender women are recognising that our culture is so deluged in misogyny and sexism that young trans girls soak it up and internalise it—not the way that boys do, the way that girls do. Because trans girls are girls. Why should the shared socialisation and history be ignored? The second issue I see is one of Kirby's apparent misunderstanding about the marketplace of ideas. This misunderstanding seems to underlie her discomfort with labeling MichFest performers transphobic. I would be a bit more diplomatic than Kirby seems to be suggesting of trans people and our young cisgender women allies, as I would say, such performers are engaged in a performance at a transphobic event—even if the performers themselves are not inherently (and is anyone really inherently) transphobic or even consider themselves allies to trans people. Would it be easier to just drop the women-born-women requirement? Sure, but I don't know that as women we ever choose the easy route. I see this as an opportunity to grow as a community, to figure out how to not engage hatefully with each other. After all, labeling performers as transphobic, regardless of their work in the queer community, threatens their livelihood. I'm going to be generous to Kirby here, I'm going to take it that when she says, "as women we ever choose the easy route" and "figure out how to not engage hatefully with each other," I am trusting her to include trans women within women (since, you know, we are). And I would agree that as various forms of feminisms (plural) have grown, they have not always taken the easy route (and MichFest comes from a feminist tradition and is reflection of not just one feminism, but several competing, intersecting, and melding feminisms) and many times have taken painful detours, side-roads, and even run into complete dead-ends. Where Kirby loses me in the above quote is with the economic argument. We should not claim performers, such as DeLaria, are engaged in an explicitly transphobic event because it might affect their ability to make a living? I think DeLaria is an amazing actress. I am a huge fan of OITNB and I'm going to watch Season 2 of the show and hope to see a lot more of her. I'm also a huge fan of Kathleen Hannah and Bikini Kill and Le Tigre were part of my teenage soundtrack, but she and her bandmates have never apologised for playing Fest, and I think that's sort of sucky—but I still support their music, and I will still see Hannah's new movie and listen to her new projects. Both of these women, and I am sure other women like them, are getting my money, be it directly or indirectly, even after a history with Fest. Calling them out for attending a problematic event isn't (and should not be) about them as horrible people (they're not) or about destroying their ability to work. There is absolutely nothing wrong with expecting our heroines, our artists, our queer icons to hold themselves to the same standards we hold ourselves, and expressing our opinions to these idols is a necessary part of discourse. And sometimes... We may find ourselves disappointed in our icons. That happens, too. I don't consider myself transphobic. I feel you can support trans community, support interaction of trans and queer politics, and you can want separate space for women-born-women. To me, they're not mutually exclusive. I feel like we have a right to say, "We need this space" and not be attacked for that. I agree, cisgender women and transgender women do have differences in lived experiences. However, it is my own opinion that these lived experiences are encompassed by the identity of "woman" and our unity makes us stronger, but I would never try to sweep these lived experiences under the rug and pretend they do not exist. And yes, you have the right to say "we need this space" and not be attacked for it (just as I oppose attacks on DeLaria or Hannah or anyone else for a history with Fest), but you do not have the right to be free from criticism for your choice. Just because those lived experiences do have differences, I do not feel that there is justification in excluding trans women from women's spaces based on the idea that such exclusion is an example of a minority gaining a space away from a majority—it is a minority rejecting an even smaller minority based on a misapprehension they are part of the majority. For all of the arguments about the nature of male privilege existing in the lived experiences of trans women, trans women are not, never were, and never will be cisgender men. Period. Our exclusion is not inhibiting the patriarchy, it is not creating a space away from the constant and ever present "manness" of our society—it is a rejection of colors and shades of womanhood, many of those experiences being surprisingly similar to those of Fest's participants, and Fest is poorer for that rejection. Keep having Fest, you won't see me trying to shut it down. You won't see me visiting Camp Trans across from "the land." You won't even see me mention Fest very often. You will see me choosing to attend trans-inclusive women's events and spaces with my cisgender sisters. You will see me watch as the number of cisgender women skipping Fest continues to grow. That's my sisterhood, and it is theirs. And it is yours, too, if you want it. I am not an organiser of Japan's Dyke Weekend, and I can't (and won't) speak for the organising team, but from a participant's standpoint, if Lea DeLaria would love to attend, I would be glad to see her come and meet the women thinking differently about what an inclusive women's space can look like. And I'd be glad to see Dawn Kirby, too.